The clear Topcoats will not yellow from sun exposure and most are under 10 VOC, making it safer for the planet's ozone. 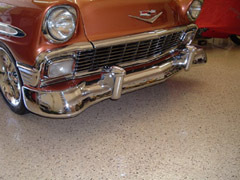 In addition, the Topcoat is "Hot Tire Resistant". It will not yellow, darken, stain or lift from hot tires. 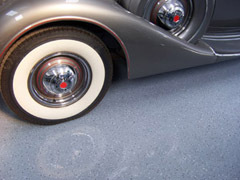 You can wipe up any tire marks from the epoxy for years to come. When other products say they are "Hot Tire Resistant" they mean it won't peel. With Roll on Rock, it's as if your car was never parked in the garage! The Roll on Rock system from Versatile features a proprietary epoxy that "wicks" deep into the concrete, creating a bond that is 3 times stronger than ordinary epoxy systems over concrete. This system will withstand at least 8 lbs. of MVE pressure, while others fail at 3 lbs. 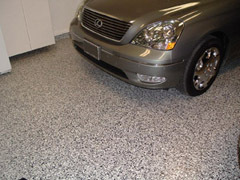 The Roll on Rock system DFW Epoxy Flooring can also be installed in one days time. 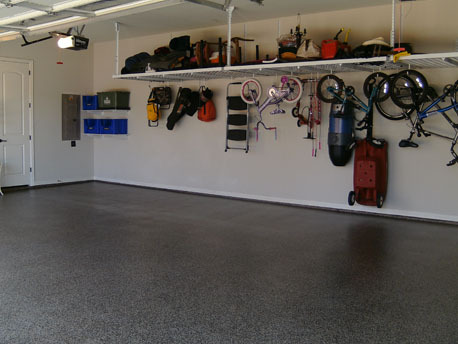 With additives we can decrease the dry time to 3 hours and have you back in the garage by the end of the day.